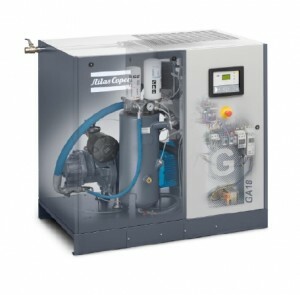 Oil-Injected Rotary Screw Compressors » Entagear Co., Ltd.
Atlas Copco’s oil-injected rotary screw compressors bring outstanding performance, flexible operation and high productivity, while minimizing the total cost of ownership. 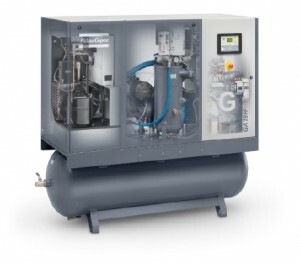 GA compressors are built to perform even in the harshest environments; these products will keep your production running smoothly. 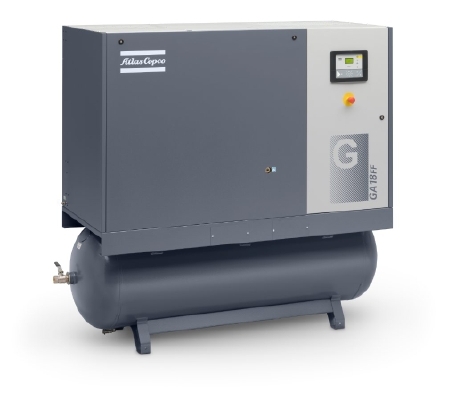 With this premium compressor series, you will certainly find the compressed air solution that perfectly matches your specific requirements. • Highest reliability – The GA series is designed, manufactured and tested in accordance with ISO 9001, ISO 14001 and ISO 1217. Ensuring a long and trouble-free life at the lowest operating cost. 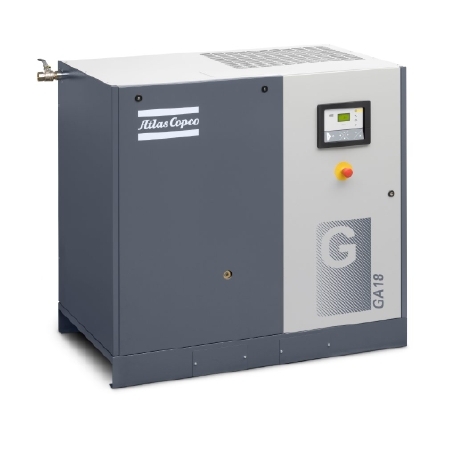 GA compressors are equipped with the latest generation of Atlas Copco’s innovative oil-injected screw element integrated with a closed gear drive eliminating the need for a coupling suitable for the harshest environment. • Reduced energy costs – GA compressors can reduce your energy costs and overall compressor lifecycle costs thanks to the use of our highly efficient element and motors. 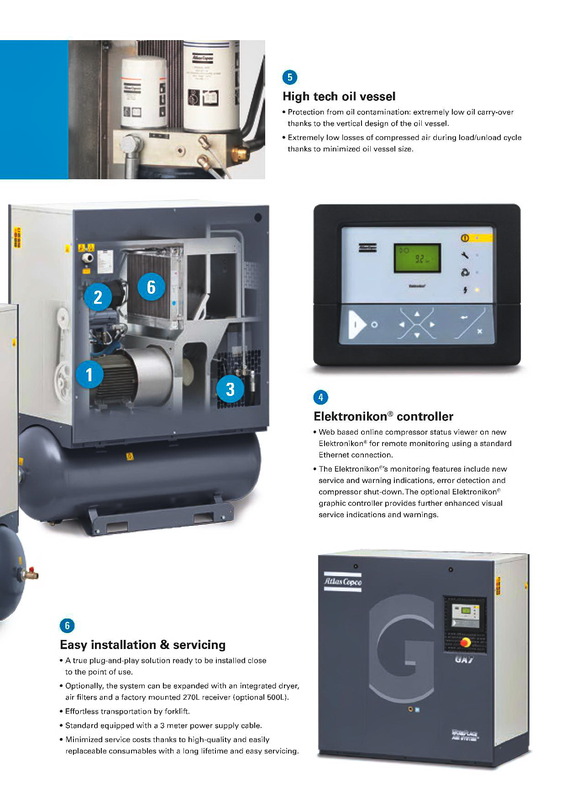 The GA Variable Speed Drive (VSD) also reduces energy costs by a further 35% by automatically adjusting the air supply to your air demand with a large turndown operating range. 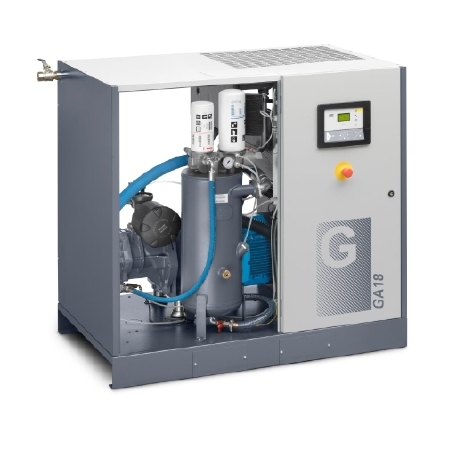 • Air system integration – The GA WorkPlace Air System can be installed where you need compressed air. 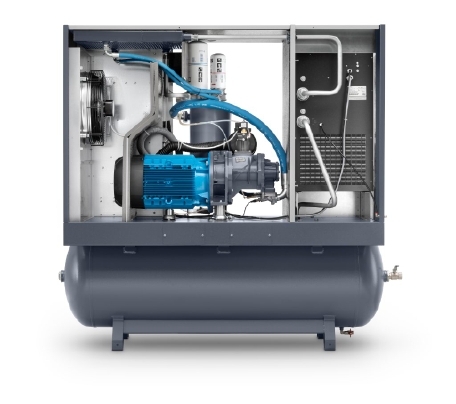 Its low noise operation and integrated air treatment equipment eliminates the need for a separate compressor room. All GA compressors are tested and delivered ready for use. The integrated options will reduce installation costs and pressure drops significantly, thus saving additional energy cost. 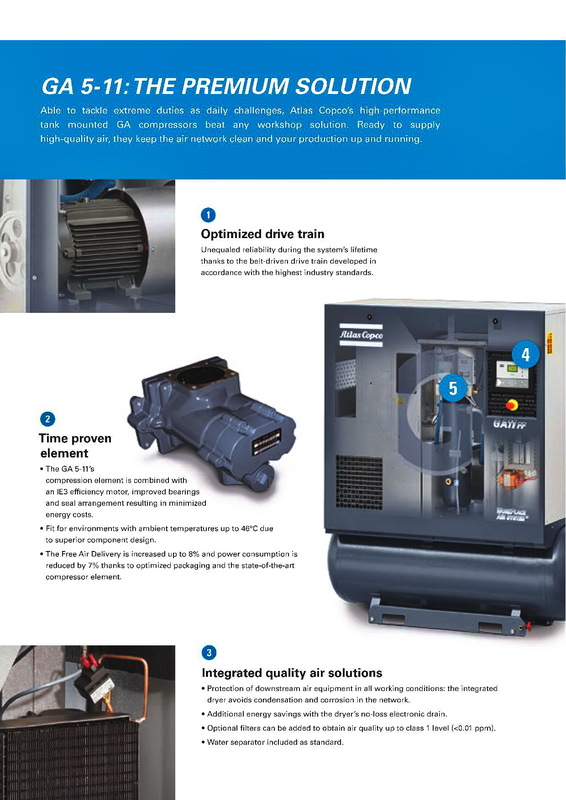 • Advanced control and monitoring – To maximize efficiency and reliability, the Elektronikon® controls the main drive motor and regulates system pressure within a predefined and narrow pressure band. The Elektronikon® controller can be adapted to your specific needs with extra sensors, digital contacts, fieldbus, Internet and SMS communication functions. In combination with the ES multiple compressor controller, the operation of your complete compressor room is optimized. • Integrated air treatment – All GA compressors have integrated dryer, filters and oil-water separator available to protect your compressed air network. This quality air expands the life of equipment, increasing efficiency and ensuring quality in your final product.